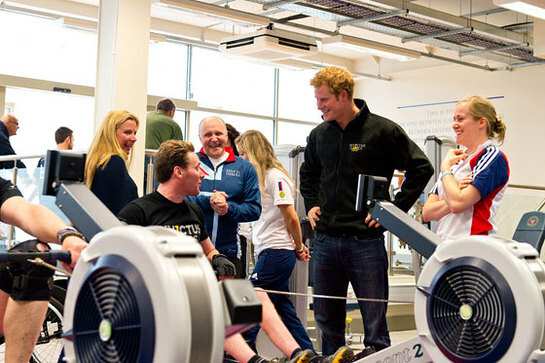 Wounded servicemen and women competed in front of Prince Harry last week to mark the beginning of a selection process for his Paralympic-style championships. The Prince met more than 25 potential competitors who are hoping to take part in the wheelchair rugby, cycling and indoor rowing events at the Invictus Games. A team of 100 serving and veteran personnel will be selected to form the British Armed Forces team in the Games at the Queen Elizabeth Olympic Park in East London in September. The selection process, run by Help for Heroes and the Ministry of Defence (MoD) and due to last for four months, began this morning at Tedworth House in Tidworth, Wiltshire. Prince Harry, who wore a black fleece emblazoned with the Games logo, said he hoped the challenge would help injured personnel in the recovery process. “I have seen how powerful sport is as a means of rebuilding confidence as well as aiding with physical rehabilitation,” The Prince said. "These men and women are fighters by nature. Help For Heroes and the MoD received around 200 applications from men and women hoping to take part in the Games. More than 300 participants from 13 nations will compete in the international sporting event, from 10th to 14th September this year. The Invictus Games are being organised with the support of The Royal Foundation of The Duke and Duchess of Cambridge and Prince Harry as well as the MoD.